The Dusting Mitt can be used wet or dry and is ideal for quick, chemical-free dusting throughout the house, including blinds, screens and other hard-to-clean areas. The Dusting Mitt can be used wet or dry and is ideal for quick, chemical-free dusting throughout the house, including blinds, screens and other hard-to-clean areas. With its thick texture; dense, plush fibers and unique mitt design, the Dusting Mitt attracts and holds dust and other dust-related allergens and won’t let them go. 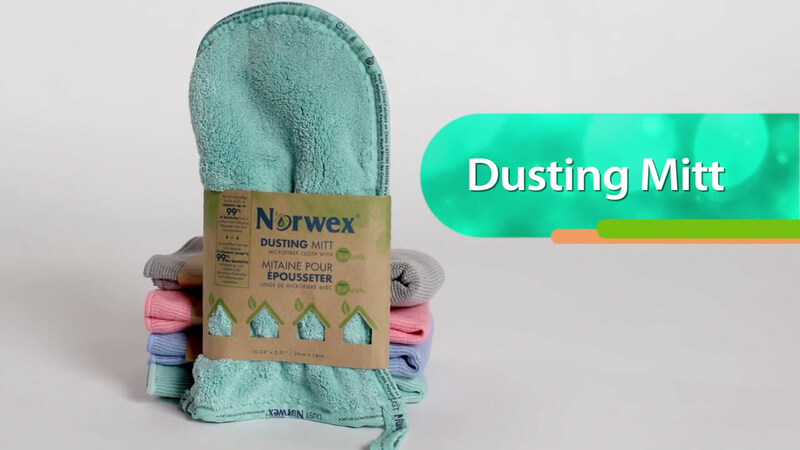 26 cm x 14 cm / 10.24" x 5.51"
Dust without chemicals using the Norwex Dusting Mitt. It attracts dust like a magnet and even keeps it from resettling. Just slip it on and you’re ready to go! The static electricity created as it passes over a surface allows it to quickly pick up dust from all surfaces, leaving your home cleaner so you can breathe easier. • Use it dry to dust all surfaces, including mini-blinds, fans, lamps, banisters, chandeliers, plants, cupboards, vents, fireplace screens and more! • Before dusting electronics, turn them off for a while as the electrostatic charge they emit can hold dust to them, competing with the pull from the static electricity in the mitt. • For heavily soiled surfaces, such as blinds and screens, moisten the mitt or use a damp EnviroCloth® and clean thoroughly. • Clean by shaking vigorously outside or by using the Rubber Brush. • When using on easily scratched surfaces such as brushed stainless steel, first test Norwex Microfiber on an inconspicuous spot. Not for use on anti-glare surfaces. • Slightly dirty microfiber can be washed with Norwex Dishwashing Liquid under warm running water and used again before laundering. Rinse thoroughly after washing and air or machine dry. a Norwex laundry detergent, which contains no fillers. Do not use bleach, fabric softeners or dryer sheets. • Rinse thoroughly after washing and air or machine dry. • The ultra-soft and fine microfiber is woven into a higher pile for a more powerful static charge to attract and hold dust for a long-lasting clean. • Used dry it creates static electricity that lifts the smallest particles of dust and dirt up into the cloth and prevents them from resettling back onto surfaces. • Traps dust and grime in the mitt and leaves surfaces cleaner, so you won’t have to clean as often. • Norwex Microfiber has the ability to remove up to 99% of bacteria from a surface with only water when following the proper care and use instructions. • BacLock*, the micro silver agent in the cloth, goes to work with self-purification properties against mold, fungi and bacterial odor within 24 hours so that it is ready to use again. The original idea behind some traditional cleaning products was that dust would adhere to the sticky, oily chemicals in them. But while the soapy or oily solution may help pull dust into the cloth, it also remains behind on the surface, attracting even more dust.